What is Heart of Borneo? ‘Borneo’ conjures up images of adventure on a mysterious island, strange creatures and encounters with exotic people. To conservationists, ‘Borneo’ is one of the world’s biodiversity hotspots. The ambitious conservation programme, 'Heart of Borneo' that some may have heard of encompasses not just any area in Borneo, but highland forests at the core, or “heart”, of the island. Made up of 3 countries in 746,000 sq km of land, Borneo’s forests are home to 221 species of mammals, 620 species of birds, 35% out of its 15,000 plant species that are found nowhere else and over 150 species of dipterocarp trees. In each tree, there are 1,000 insect species. And that’s just a rough estimate. Over the past ten years, 360 new species have been found. That’s an astonishing 3 discoveries a month! But all these diversity would be lost if Borneo’s highland forests are fragmented. With threats coming from all sides, these forests have to be a continuous whole. Successful rainforest conservation requires inter-connected forests, without which hundreds, or even thousands, of species would become extinct. We need to act fast and we need to act now. The ‘Heart of Borneo’ is the only remaining place in Southeast Asia that still holds huge tracts of pristine forest. Straddling the trans-boundary highlands of Brunei, Indonesia and Malaysia, the future of this forest heritage depends on joint-cooperation by all three governments as no one country can manage these unique forests alone. 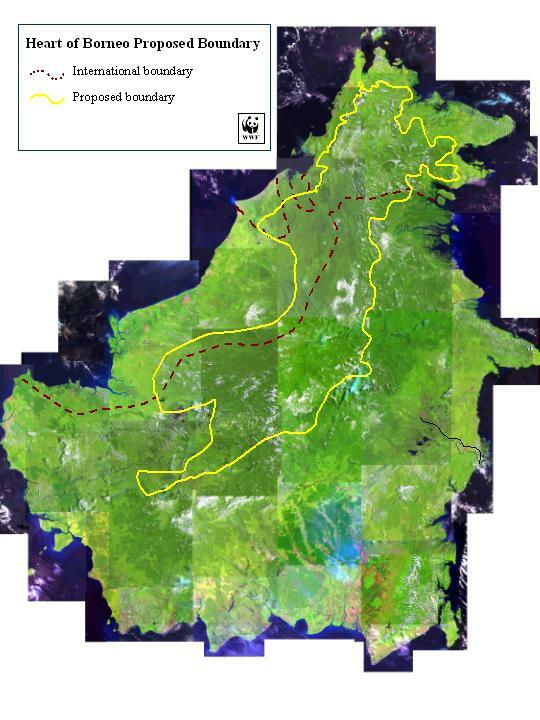 WWF aims to assist Brunei, Indonesia and Malaysia to conserve the Heart of Borneo – a total of 240,000 sq km (that’s 2 million hectares!) of equatorial rainforests – through a network of protected areas and sustainably-managed forest, and through international co-operation led by the Bornean governments and supported by a global effort. A joint declaration, signed by the 3 governments is a crucial step in securing commitment for the Heart of Borneo. It really is now or never.